It is fitting that the first photograph of the 21st century includes an illegal immigrant. Yes, scanner technology is there as well, and we’ll get to that, but let’s stop and consider what we are seeing. A stunning image, to be sure, but also one that mashes up a half-dozen critical transformations in the global environment, and yet doesn’t look like a mash-up. Because the photo has the autonomy of a work of art, it both prompts and resists interpretation. We see the patterns that already are transecting our lives to construct a titanium cage of biopolitical social organization, and yet we don’t see anything clearly. The gauzy colors and plastic emptiness of the scan are a parody of transparency, while the dark silhouette of the body blocks any identification above the primal level of embryonic species existence. 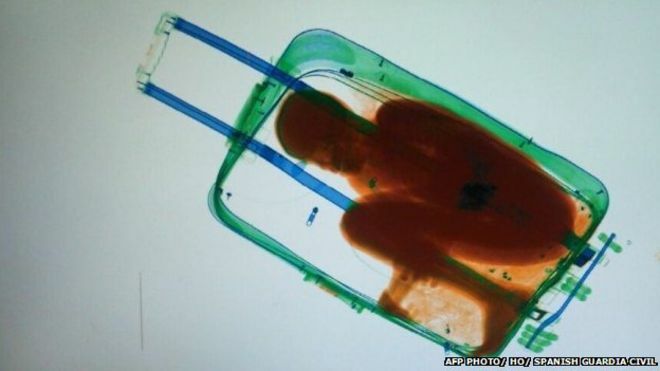 The suitcase seems to be a womb; even the placenta is visible. The photograph itself seems to be floating in some larger womb, some larger context we can’t yet see but only feel all around us, as if the distant sounds of the world to come were reverberating through some invisible fluid. It’s a boy, by the way. He was being smuggled into Ceuta, a Spanish territory on the coast of Morocco, on Thursday. He has a name (Abou), and a father who now is in custody, and we can hope that other family members can be located. But we already know that his situation is not exactly ideal. There are over 200 million migrants in the world, and you can bet that most of them are not medical doctors or engineers. Millions of people have to move across the globe simply to work, while those left behind struggle with all the problems that come from separation within the family and fraying of the social fabric within the community. There are many photographs of migration, migrant labor, and the like (and see The Migrant Image: The Art and Politics of Documentary during Global Crisis, by T.J. Demos). This photograph, by showing less, shows more. We are not shown this or that immigrant and the typical circumstances and deprivations of the diaspora. Instead, the image points toward the global forces that are converging to make all labor migrant labor, and all of us illegal aliens. The photo captures by turns the bare life of the human subject in migration; the emblematic equipment of global transportation and, with that, a powerful but harsh global economy that permeates everyday life; the vulnerable individual in neoliberal economic systems who has to be hidden and humiliated to acquire the means to live, and then is hidden and humiliated while working; the digital technologies for comprehensive surveillance of those subjects; the extent to which modern technologies that promised liberation can become cheap instruments of confinement; and not least, via the eerie suggestion of biomedical laboratory equipment, materials, and optics, the planned transformation of human nature. Indeed, one can imagine that the photo wasn’t taken for a human being, but rather for another machine. So it is that a digital image from a government scanner of an illegal immigrant can become the first photo of the new century. The others of the past 15 years have been recording the passage of time, but this one has captured the brave new world that is forming, still largely in the darkness of a time we can’t yet see. A world, perhaps, where the post-human laborer already is being incubated. Photograph by Spanish Gaurdia Civil/HO/Associated Press. A BBC report on the incident is here.